This entry was tagged Enoshima, five-headed dragon. I’ve read theories that the dragon represents rivers which frequently flooded (thus “devouring” people). 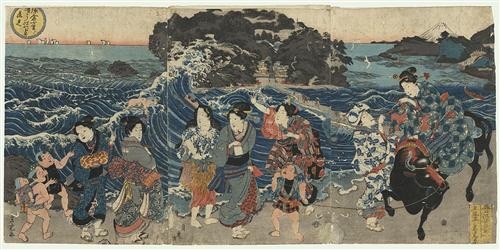 Do you happen to know why the Enoshima Benzaiten is naked? In Japan, the dragon (and snake) is associated with water and rivers. This association is so close that it is still preserved in everyday speech, in which a waterspout or tornado is tatsumaki (竜巻, “dragon-coils”) and a water faucet (from which water issues) is jaguchi (蛇口, “snake-mouth”). M. W. DeVisser, in The Dragon in China and Japan, writes: “Their dragons [the dragons of the ancient Japanese] were kami, gods, who lived in rivers and seas, valleys and mountains (in rivulets, lakes and ponds), bestowing rain on their worshipers. That those river gods could also cause wind we learn from the above quoted passage of the Nihongi, where the god of the Northern river is said to have made a whirlwind arise in order to submerge the calabashes. So the three kinds of dragons, to be found in Japan, original Japanese, Chinese, and Indian, all have one feature in common, i.e., the faculty of causing rain; while the winds belong to the domain of the former two.” (Dragon in China and Japan, pg. 154). At the time of most of the events related in the Enoshima Engi (the Kofun era, roughly 300-710 AD), the inhabitants of the area around Enoshima lived mainly on the sides of low hills, as indicated by the two maps below. From the crests of most of these hills, an observer could see the winding course of the Kashio River below. It is a meandering river, snaking its way through the drowned valley of what previously was the Ofuna estuary (大船入江), shown in this map of prehistoric Jomon times. As a matter of fact, the Japanese term dako (蛇行, winding snake-like, i.e., meandering) is used to describe the river in geography textbooks. Below is a detail from a set of illustrations of the Tokaido Road that was completed in 1806 (東海道分間延絵図, from 柏尾川物語, pg. 30). The detail shows the upper reaches of the Kashio River around present-day Totsuka. Note the broad flood-plain and the way the river snakes through it (1). The point is that to ancient observers on the hills, the Kashio River would have looked like a snake or dragon lying below (1b). Another instance of a dragon-shaped waterway in Japan being regarded as the home of a dragon is here at Inbanuma. 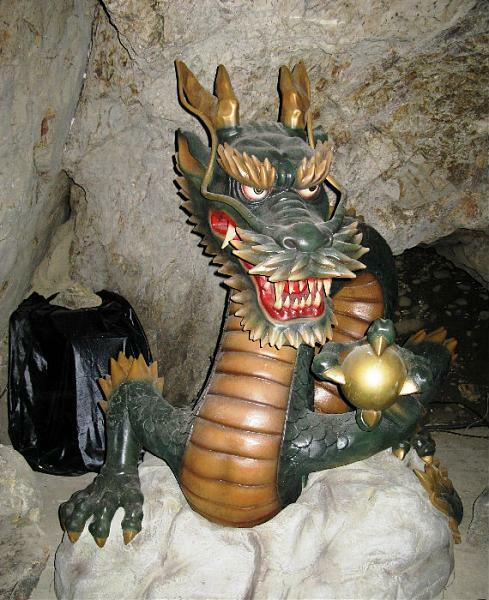 The lake was the lair of a fierce, evil dragon, a dragon-king with five heads on one body (see translation). From their vantage point on the hills, these same ancient observers would have seen the main tributaries of the Kashio River. At present, the river has four main tributaries from present-day Ofuna southward: they are the Sunaoshi (砂押川), Kobukuroya (小袋谷川), Shin (新川), and Otsuka (大塚川) rivers (see this page on Kamakura’s rivers, for example). One major characteristic of the Kashio River is that all of its main tributaries are on the east or southeast side of the river. To observers on the hills, these four tributaries would have looked like heads on the body of a sinuous dragon, especially if the tributaries had their sources in a lake or pond, with the head formed by Sagami Bay, which reached as far as present-day Fujisawa in earlier times. Now we can surmise why Kokei described the destructive dragon, whose lair was in the lake, as having five heads. Below is a diagram of my conception of the dragon-like shape that the ancient observer may have seen from a location between Kawana, which is approximately where the Kashio River entered Sagami Bay at the time covered in the Enoshima Engi, and present-day Ofuna during the late Jomon and Yayoi eras. In this view, the mouth of the dragon corresponds to the mouth of the Kashio River. The diagram is based on the page referenced above with my addition of a portion of Sagami Bay corresponding to the main head of the dragon (2). Note that all of the tributaries, which correspond to the subsidiary heads of the dragon, are on one side. Nowadays, of course, the area has been changed so much by engineering works that some of the tributaries no longer are recognizable from the hills. Judging from depictions on pottery, the snake appears to have gained a prominent role in the middle Jomon era. 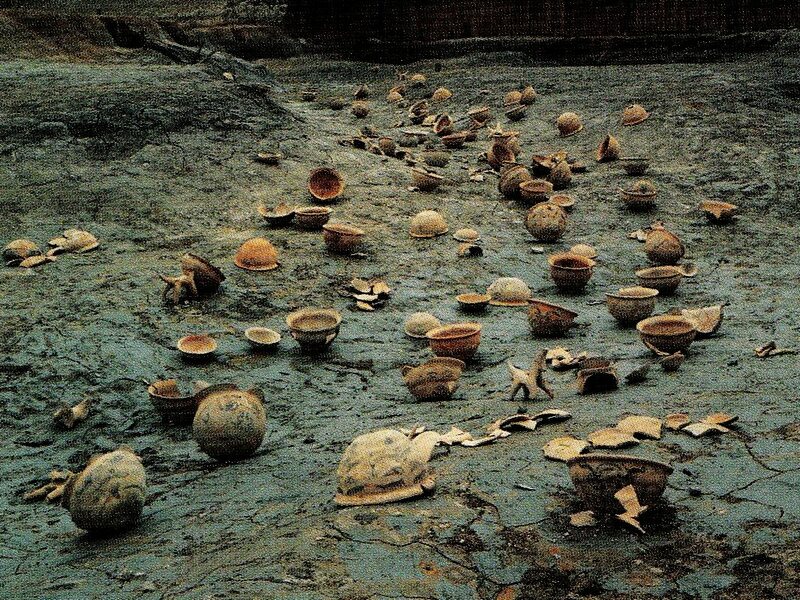 Professor Hiroshi Arakawa (荒川紘), author of 龍の起原 (The Origin of the Dragon), states that around 1000 BC, pottery underwent a substantial change, with the quantity of pottery increasing sharply, especially in Japan’s Chubu, Kanto, and Hokuriku regions. Decorations tended to be abstract and seem to have had a magic-related significance. Snake motifs predominated in the cateogy of non-abstract decorations (龍の起原, pgs. 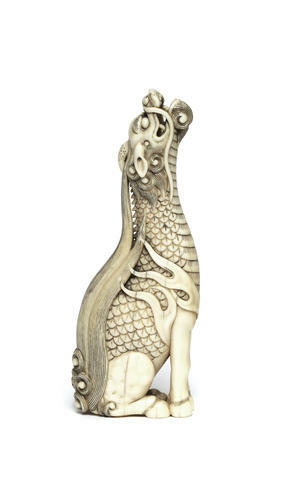 134-5); for example, this figurine with a snake attached to its head (from 龍の起原, pg. 135). If the snake had great significance in middle Jomon culture, an individual would not need much imagination to stand on a hill overlooking the Ofuna Estuary (precursor of the Kashio River) and liken the course of the water to the body of a snake, its mouth to the mouth of the snake, and its tributaries to multiple heads on the snake. According to Professor Arakawa, the snake motif disappears with the advent of the rice-farming-based Yayoi culture, which appears to have its origin in China, south of the Yangtse River (龍の起原, pgs. 141-3). Japan’s first depictions of dragons appear on late Yayoi pottery (roughly 100-300 AD) (龍の起原, pg. 143). These examples are from western Japan. 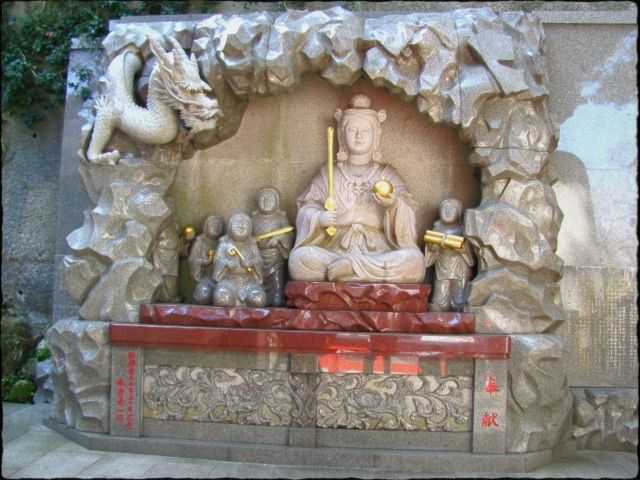 Associated Chinese ideas, such as amagoi, or praying to the dragon-deity for rain (雨乞い), probably accompanied the dragon concept. Such ideas, which probably played important roles in a rice-farming-based culture like the Yayoi, assume that the water-associated dragon-deity has control over natural phenomena such as rain, the lack of rain, hail, and so on. To sum up the above section, there is no evidence (apart from the Enoshima Engi) that the inhabitants of the vicinity in the middle Jomon and late Yayoi periods identified the Kashio River as a snake or dragon. However, it would have been entirely natural for them to have done so (3). “the evil dragon, accompanied by the spirit of the wind, demons, mountain spirits, and other spirits, wreaked calamities throughout the land. Hills crumbled, releasing floods and causing damage resulting in plagues and revolts” (see translation). For a sixty-year span around the turn of the first century AD, the evil dragon constantly made fire (or heavy rains, the text is not clear here) and rain descend on the region, forcing the inhabitants to seek shelter in caverns. At the beginning of the sixth century, the dragon invaded villages in the locality, swallowing children and forcing the villagers to move to a safer place.The people even offered a human sacrifice to the dragon-god, but the offering was in vain. The dragon’s physical appearance is described as follows. The dragon’s “eyes emitted piercing rays like the sun at daybreak, and its torso was surrounded by black clouds” (see translation). It is obvious that much of the physical appearance of the dragon (the black cloud surrounding its torso and the lightning-like rays emitted by its eyes) and most of the destruction caused by it (the storms and floods it caused) are related to water in the broadest sense. Obviously, a dragon can not fill a village. The term みちて has a semantic range much like “filled” in English, and the passage is not comprehensible, unless the dragon was amorphous (i.e., like flood waters). If the dragon had eaten the children, there would be no bodies left to bury. Obviously, they were victims of something else, i.e., flood waters, in this case. By now it should be clear that the dragon can be viewed as a deification of water, which was the environmental factor that was the biggest threat and benefit to the lives and livelihoods of the inhabitants of the locality. It is likely that the villagers were threatened by raging flood waters of some sort (refer also to this note and footnote 5 below). These observations lead to the conclusion below. The correlations between the characteristics of the dragon, a god of rivers, and the flooding and other environmental conditions related to the violent rivers of the locality are clear. This website argues that the dragon described in the Enoshima Engi was an embodiment of the waters of the Kashio and Sakai Rivers, which were the greatest threat to the lives and livelihoods of the people in the locality. Flooding in these rivers caused widespread devastation in the past, including damage from floodwaters and landslides, as well as disease in the wake of floods. The dragon-god of the river waters also governed rain (too much of which also causes landslides), lack of rain (drought), hail, and other things that fell from the heavens. In other words, the destructive dragon in the Enoshima Engi was the embodiment in the popular mind of the overwhelming threat posed by water to the lives and livelihoods of the people in the locality. In their minds, water (and the lack of water) was governed by the capricious and destructive dragon-god, who ruled over river waters, rain, and other things that fell from the skies. Now that we have determined the basic nature of the dragon, we can return to identifying more locations and the prevailing conditions in the area. (1) At present the Kashio River and the lower reaches of the Sakai (Katase) River no longer snake; their banks were encased in concrete during the postwar period. Nonetheless, the Kashio River is still violent. From 1999 to 2004, I lived on a bank of the Kashio-Sakai River, within walking distance of the events described in the Enoshima Engi, and I can testify to the power the river still commands. Whenever there is heavy rain into the river’s catchment basin, as when a typhoon passes in the vicinity, which occurs several times annually, the river rises drastically within a few hours, and often there is flooding somewhere along its course. (2) If the extent of Sagami Bay (in ancient times) is regarded as corresponding to the mouth of a dragon, then Enoshima Island would correspond to the jewel that dragons are often pictured as trying to catch. For this observation, I am indebted to Mr. Kurobe (personal message). (2b) (See A Possible Relationship between the Puyang River in China and the Kashio River) New (as of February 2006). This section points out similarities between the Kashio River and the Puyang River south of Hangzhou, China. The Puyang River frequently experienced heavy rains in its hilly catchment area, swelling the river. The heavy volume of water rushing down its channel would rush up against the incoming tide, causing serious flooding. A similar situation may have existed around the Kashio River.